“Buy me, I’ll change your life: taste and consumption” Introduction Taste is the faculty of discriminating what is artistically and aesthetically appropriate. It reflects the states of social relations such as classifying people, things and practices into sets of unequal value. Moreover, it serves as a marker of status and identity of a person (Douglas & Isherwood 1979 p. 12). People who have similar tastes form groups and discern outsiders who are easily identified by their different values and aesthetic ideals. Bourdieu’s theory rejects the idea that the preferences of consumers are caused by the inherent, personal selections of their human intellect, but rather, socially conditioned and determined by the socially predominant so as to impose the distinction from other classes (Allen & Anderson 1994: 70). In this retrospect, the phrase “buy me, I’ll change your life: taste and consumption” is possible because some people have the tendency to buy what is in fashion and consume what the leading class consumes in order to place themselves amongst the socially high ranking class. 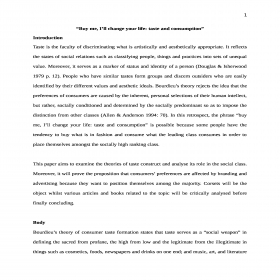 This paper aims to examine the theories of taste construct and analyse its role in the social class. Moreover, it will prove the proposition that consumers’ preferences are affected by branding and advertising because they want to position themselves among the majority. Corsets will be the object whilst various articles and books related to the topic will be critically analysed before finally concluding. Body Bourdieu’s theory of consumer taste formation states that taste serves as a “social weapon” in defining the sacred from profane, the high from low and the legitimate from the illegitimate in things such as cosmetics, foods, newspapers and drinks on one end; and music, art, and literature on the other end (Allen & Anderson 1994:70). Bourdieu’s theory rejects the idea that the preferences of consumers are caused by the inherent, personal selections of their human intellect, but rather, socially conditioned and determined by the socially predominant so as to impose the distinction from other classes (Allen & Anderson 1994: 70). Trentmann (2006:1-27); Brewer & Trentmann (2006: 19-69) support this argument, claiming that in many domains of cultural effort such as architecture, cooking, the decorative arts, clothing, music, gardening and religious worship, tastes are confined within the community and fashion is bounded by the observance of historical and cultural preferences. Hence, taste formation is grouped and paradigmatic in the intersecting communities of taste and are sustained and promoted through generations, linking the past to the present (Harvey et al 2011:247). Such as in the case of the decorative arts of William Morris i.e., furniture, embroidery, stained glass, wallpapers and other decorative pieces for public buildings and big houses. Morris’ works were considered excellent products at his time and the succeeding generations of designers acknowledge his excellent works of art and integrated Morris’ practices into their own, promoting Morris’ designs to all their other products – from cards to wall hangings, to book jackets and many more, making Morris’ design the quintessence of Englishness (Naylor 1980). However, Baudrillard’s theory delves into the likelihood of consumption as the major basis of the social order and of its internal categorizations (Baudrillard 2001:2). Baudrillard argues that consumer objects institute a system of classification that ciphers groups and behaviors. According to his theory, consumer objects are affected by the linguistic sign function such as in advertising. Advertising codes consumer products by using symbols that set them apart from all other products. However, the actual effect of the product is when it is finally consumed – transferring its signification or “meaning” to the consuming person. The vast composition of signs is thus established which guides the society whilst offering the individual an imagined sense of self-determination and freedom to choose (Baudrillard 2001:13). Baudrillard (2001:29) adds that through the multiplication of objects, material goods and services, affluence and consumption become obvious. People are now surrounded by modern objects and all kinds of products competing in different advertisements communicated through various forms of mass media. The power of advertising provokes the manufacturers to compete in the imaginary competition so as to win the approval of the consuming masses. Their messages are the same, encouraging the people to buy because their product is good and consumed by the rich and famous. Others use message like, “buy this, everybody is using this”. In this sense, consumers use their freedom to choose so as to feel unique but still going for products or brands that resemble what the rest of the community or the social dominants are patronizing (Baudrillard 2001:15). Meanwhile, Thorstein Veblen’s theory of conspicuous consumption (1899/ 1939) connotes that the accumulation of wealth is not only motivated by the need for survival, but significantly, by the honor that goes with possessing the wealth. Veblen adds that in order to be bestowed with honor, wealth must be displayed either through consumption of expensive products or visible leisure such as excessive vacation trips or abstaining from employment. In Veblen’s theory, the standards of taste do not mirror the superficial standards of beauty, but through the costliness displayed under the guise of beauty (p. 128). It is always the honor that goes with the possession of expensive objects that determines the ideals of taste. On the other hand, Miller’s views in terms of consumer culture and consumption were drawn from Bourdieu and Veblen’s, claiming that consumption plays a contributory role in social distinctions. To him, the objects attain their meaning of social differentiation by imposing tastes on the society. Miller states that “taste is the key dimension controlling the significance of ordinary goods” (Miller 1987, p. 149). Similar to that of Bourdieu’s theory of consumer taste formation, Miller believes that tastes work through social distinctions; tastes are represented by the social groups that an individual belongs to. Education and the total social environment are the key players in the formation of tastes (Miller 1987, p. 149). Business in Leadership My experiences in life have taught me that anyone can be a leader in his own right, with or without formal authority, as long as you know how to influence or convince others for the accomplishment of a common goal. Leadership can be practiced in situational interactions where a person can solicit the help of others in doing a task or by using charisma or intelligence in guiding or directing others (Chemers, 1997). I have personally experienced this while doing a group research project where I was one of the group members. In that project, we were tasked to make a comprehensive analysis on a successful organization. Unfortunately, our team leader got hospitalized and I had to take his role to keep going. That project was a team project and everybody was expected to cooperate. Gibson, et al (1980) defines teamwork as a cohesive action of team members in harmonizing their efforts and assistance for the delivery of a common task. I directed every team member on what task to perform. Our teamwork was great, everybody was present in our meetings and the division of labor was fairly distributed. Each member was interactive and cooperative up to the presentation of our project. I could say that one of the secrets to our success was the good exchange of communications, even if they were mostly done through emails and text messages. Communication was very important in achieving teamwork within the group. Though we had differences, they were set-aside and just focused on helping each other till we delivered our task. That project taught us that good interaction among team members is important in each team. My level of capacity as a leader is The Achiever. My leadership style is strategic and result-oriented. I certainly believe that power is achieved not only from expertise and authority but also from motivating others. One key to motivating others is through good communication and being a good follower. “Everybody got a boss”, says Jim Collins to August Turak (2012). “The Vice President reports to the President and the President reports to the CEO and the CEO reports to his wife. All God’s children got a boss. If you want to be a good leader, you must be a good follower”(Turak, 2012, p. 1). Even Aristotle says, “He who cannot be a good follower cannot be a good leader”. Thus, one can motivate others by practicing what he is preaching. Just Like what I did in our group project. Although I just took the role of a leader due to the absence of our team leader, I functioned like a real team leader by setting meetings and discussing with the other team members the important issues needed to be resolved so we can finish the task. Although I sensed some of my team members were questioning my authority to give orders, the sincerity and initiatives that I put into work perhaps made them realized that I was leading them well. Moreover, they saw me working with them and not just giving orders. 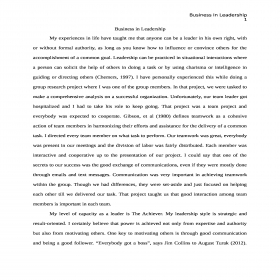 To better understand the current growth in my leadership abilities and flexibility, I will be comparing it with the following expectations: Context-setting agility My ability to scan the environment, structure the initiatives needed and determine the best outcome that should be achieved was manifested in the group project we did. I was able to sense that the hospitalization of our leader would lead us hanging in the air and failing the subject so I initiated the move to talk to my other team members and offered my services to be the leader’s replacement. That move saved our grades and we were able to prove our agility in undertaking initiatives that would benefit us all. Stakeholder agility It is expected that a leader has the ability to participate with major stakeholders in measures that would solicit support for the proposed initiatives (Cambria Consulting 2010). Hence, I identified our major stakeholders which include all the team members and the officers in the company on study. I met with my team members first and discussed what we should do to achieve our task. Then we came up with the “things to do” and our strategic plan.Then we met with the company officers and laid our intention. Luckily, they were open to the idea and supported us with all the information needed for the company analysis. Creative agility During the project, I thought then that everything was fine since the company officers and employees were very cooperative in giving us information. 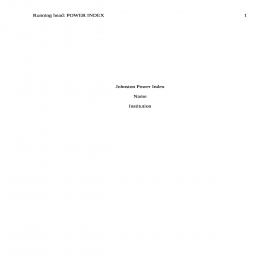 However, when we were already doing the report, we encountered problems such as who will be writing the Introduction? The Conclusion? The graphs and charts? It appeared that the one tasked to encode does not know how to do graphs and no one among the members wanted to do the Introduction and Conclusion. 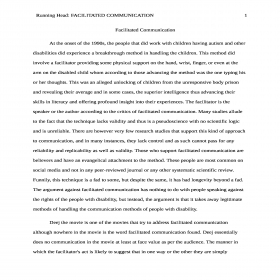 However, the problem was solved when I decided to volunteer in writing the Conclusion and the other members help in writing the Introduction and making the graphs. Self-leadership agility Self-leadership agility necessitates stepping back and being more conscious of one’s feelings, thoughts and behaviors and trying with novel and more operational strategies (Mackay, 2009). Hence, in my case, I want to be a Catalyst leader, the kind of leader who can articulate inspiration and innovation and can motivate people to make a vision into a reality. In the future, I would like to be an instrument in empowering others and be a medium in facilitating positive changes in their lives. 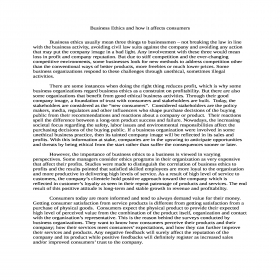 Business Ethics and how it affects consumers Business ethics usually mean three things to businessmen – not breaking the law in line with the business activity, avoiding civil law suits against the company and avoiding any action that may put the company image in a bad light. Any involvement with these three would mean loss in profit and company reputation. But due to stiff competition and the ever-changing competitive environments, some businesses look for new methods to address competition other than the conventional ways of better products, more freebies or much lower prices. Some business organizations respond to these challenges through unethical, sometimes illegal activities. There are some instances when doing the right thing reduces profit, which is why some business organizations regard business ethics as a constraint on profitability. But there are also some organizations that benefit from good ethical business activities. Through their good company image, a foundation of trust with consumers and stakeholders are built. Today, the stakeholders are considered as the “new consumers”. Considered stakeholders are the policy makers, media, regulators and other influencers who shape purchase decisions of the buying public from their recommendations and reactions about a company or product. Their reactions spell the difference between a long-tem product success and failure. Nowadays, the increasing societal focus regarding the safety, labor issues and environmental responsibilities affect the purchasing decisions of the buying public. If a business organization were involved in some unethical business practice, then its tainted company image will be reflected in its sales and profits. With this information at stake, companies are in the upswing to anticipate opportunities and threats by being ethical from the start rather than suffer the consequences sooner or later. 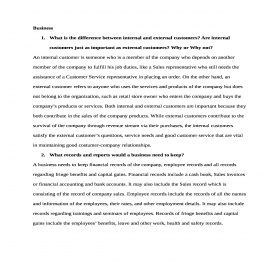 However, the importance of business ethics to a business is viewed in varying perspectives. Some managers consider ethics programs in their organization as very expensive that affect their profits. Studies were made to distinguish the correlation of business ethics to profits and the results pointed that satisfied skilled employees are more loyal to the organization and more productive in delivering high levels of service. As a result of high level of service to customers, the company’s clientele hold positive approach toward the company which is reflected in customer’s loyalty as seen in their repeat patronage of products and services. The end result of this positive attitude is long-term and stable growth in revenue and profitability. Consumers today are more informed and tend to always demand value for their money. Getting consumer satisfaction from service products is different from getting satisfaction from a purchase of physical goods. Consumers expect the physical product to provide their expected high level of perceived value from the combination of the product itself, organization and contact with the organization’s representative. This is the reason behind the surveys conducted by business organizations. They want to know how consumers perceive their products and their company; how their services meet consumers’ expectations, and how they can further improve their services and products. Any negative feedback will surely affect the reputation of the company and its product while positive feedbacks will definitely register as increased sales and/or improved consumers’ trust to the company.